Diehn, Andi. Shakespeare: Investigate the Bard's Influence on Today's World. Illus. Samuel Carbaugh. White River Junction: Nomad Press, 2016. 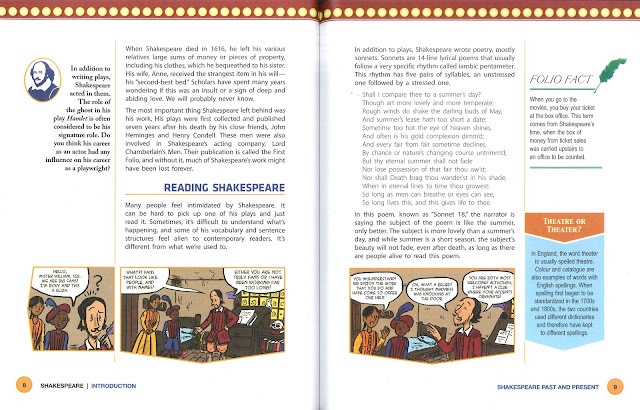 The number of resources on Shakespeare for grade-school kids increases every year. Some are tremendous, some are mediocre, and some are very bad indeed. But there's often not much to tell them apart. 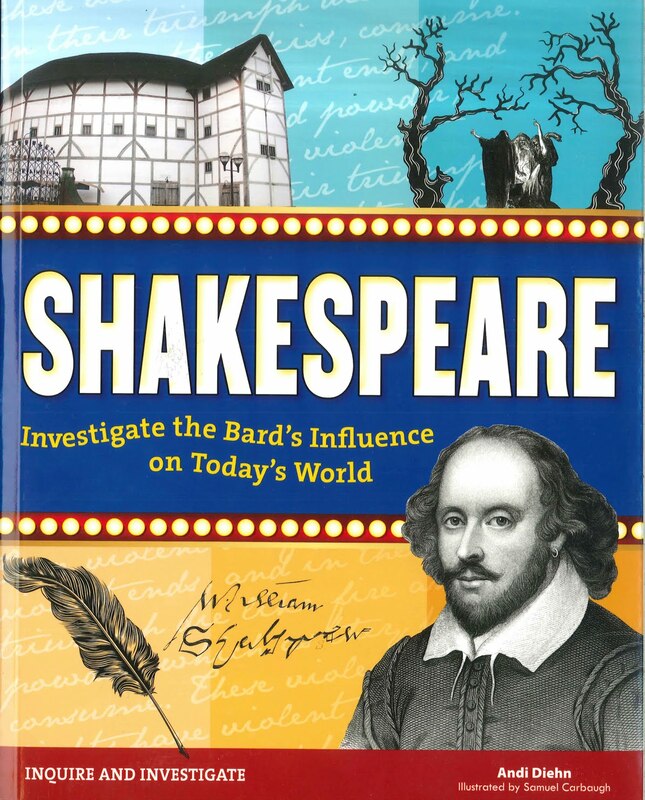 But Shakespeare: Investigate the Bard's Influence on Today's World stands out. It's the only one (so far) for which I provided editorial advice. That means that a lot of the myths often presented as facts are absent from this volume. And it also means that the dates are correct and the names of the characters in the plays are spelled correctly. Beyond that, it's a good, solid introduction to Shakespeare's life and times. Further, it continually connects Shakespeare's themes, plots, and characters to the present day, demonstrating the relevance of Shakespeare with subtlety and flair. I'm providing a two-page spread as an example. The book is highly-readable and has many interesting sidebars that enhance rather than distract from the main body of the book. Shakespeare: Investigate the Bard's Influence on Today's World is an excellent resource, whether used as classroom or homeschool curriculum or just read for its own merits.